Did ya know that Mooshies on Brick Lane had their first birthday last month? 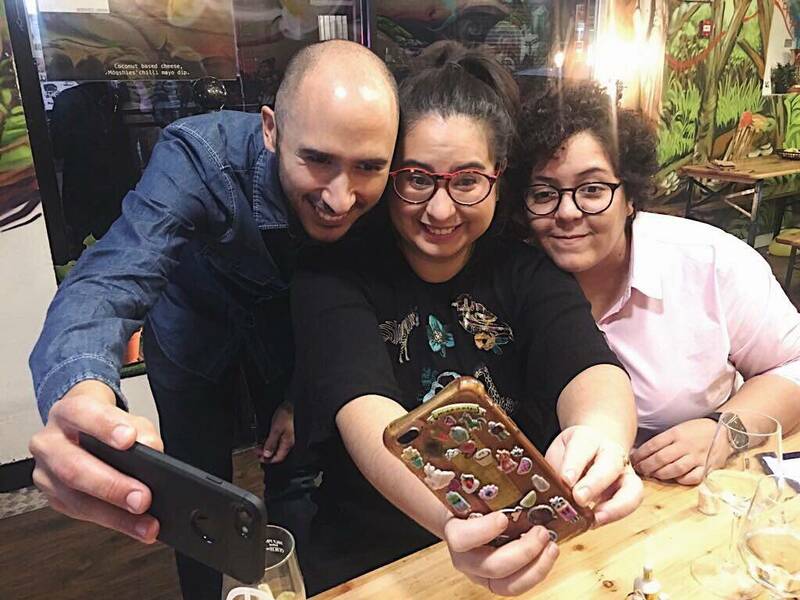 I feel a little embarrassed to say (considering how many people recommended them) that their birthday event was the first time I had ever visited… And JEEZ, it was a wonderful experience for my taste buds (+ I met some lovely people), so I thought it was only right I blog about it. At the event, everyone was able to try each of their four burgers, as well as some of the tasty sides. When I say try, I mean everyone was given half a burger, if they wanted it… For real. I unintentionally ate the equivalent of two giant burgers + sides on my visit and honestly I’m getting a little full thinking about it. When making their burgers Mooshies don’t use seitan like alot of others do (by the way – I’m not bad mouthing seitan here, I just think it’s nice to have variations, ey!). Instead they use vegetables and pulses to create the fillings. Out of the four burgers they serve, there’s only one that isn’t available as a gluten-free option – which I think is pretty damn good! As I’ve mentioned before on my blog, I’ve never eaten meat or fish, so I don’t have anything to compare to taste/texture wise, but some of the burger fillings looked pretty similar to non-vegan burgers! Fillet-Om-Fish was the the first burger I tried. The ‘fish like’ fillet is a piece of battered aubergine, served with tartar sauce and nori seaweed. There’s also some vegan cheese and lettuce in there for good measure. Out of the four this one really made me question that it actually was (italic) vegan. I mean of course it was, but the texture and flavour confused me a whole a lot. What’s Your Beef? burger contains a patty made with quinoa and black bean, Mooshies burger sauce, caramelised onions, gherkins, and vegan cheese. This was so lovely & flavoursome, and despite usually asking for no-gherkins I wasn’t even aware they were in it at this point, and the collective burger fillings tasted great! Pulled Mooshie burger main ingredient is jackfruit, which is supposedly an alternative to pulled pork. Without a point of reference I couldn’t tell you if tastes similar, but it does taste daaamnn good. I’ve recently got super into jackfruit – it’s my go to menu favourite for something a little different! (+ it’s fruit, right so probably relatively healthy-ish?) The pulled jackfruit is flavoured with bbq sauce and served with coleslaw! Brick Lane Bhaji was the last burger I tried and I was pleasantly surprised. I wasn’t sure how I would feel about an onion Bhaji served inside a burger, but this was gooood. Created to pay homage to the street they’re on (Brick Lane) this was like a delicious Indian takeaway perfectly captured in a burger, with just the right amount of spicy kick. Also in the burger was onions, tomatoes, coriander, mango chutney, and a dollop of guacamole because vegans (myself included) bloody love Avocado. All of the burgers cost £7.50 apart from the Brick Lane Bhaji which is slightly more (but oh-so-worth-it) at £8.50. At the event I arrived a little late and was sad to hear I had missed out on the vegan cheese sticks (dang, I just love cheese): but someone overheard and brought a serving up just for me! 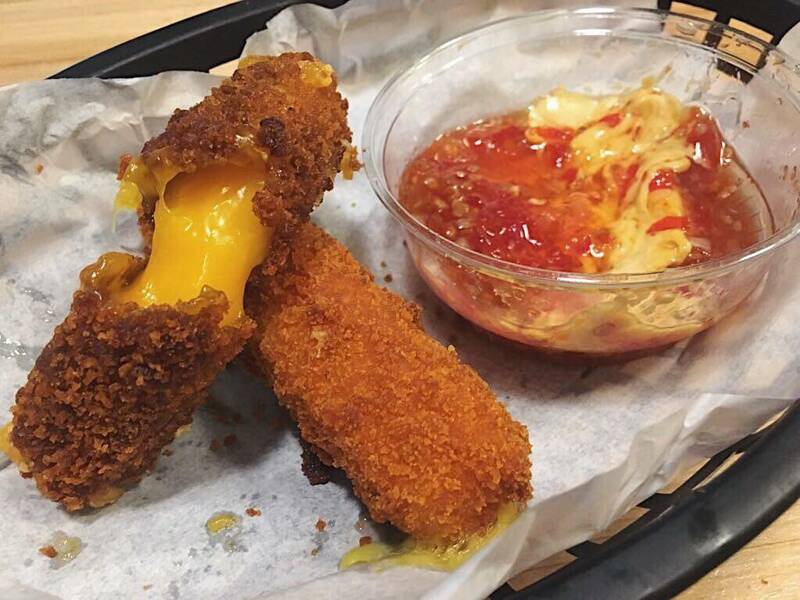 These were just incredible – a true contender for the popular non-vegan mozzarella sticks! 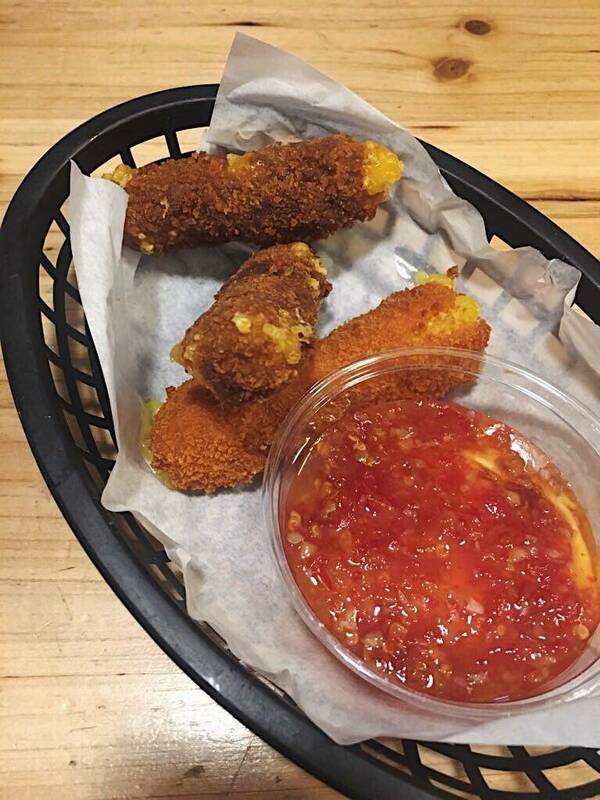 They’re made with violife cheese, battered, and served with a sweet chilli & garlic mayo dipping pot. They were stringy & cheesy, and for sure something I’ll be going back especially to have again. On the menu there is also ‘chick-p bites’, as well as sweet potato fries (served with cheese if wanted), as well as homemade guacamole with plantain chips! 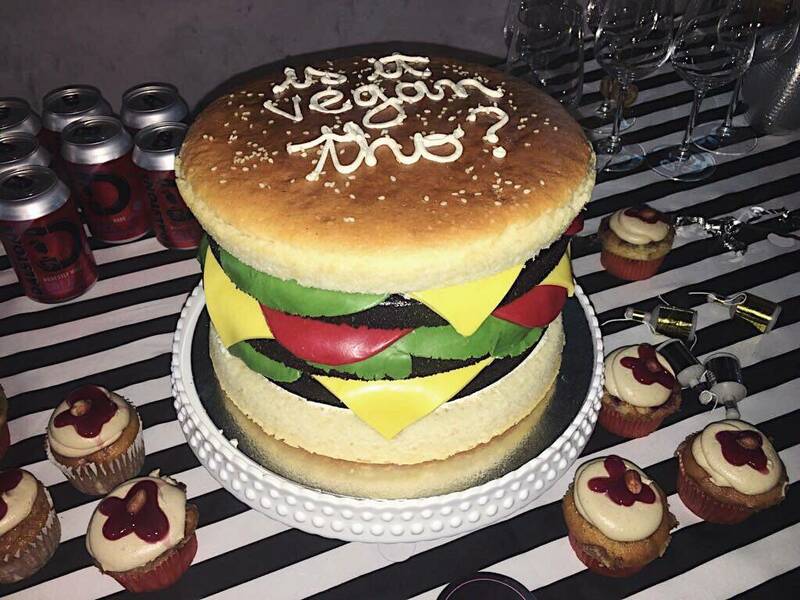 Vida Bakery provided the the most incredible giant burger cake especially for this birthday occasion. However usually on the menu the options are theee kinds of brownie: Peanut (gluten-free), Match (gluten-free) and Oreo… I’ll be trying the Oreo one next time I visit as a matter of urgency, but in the mean time feast your eyes on the phenomenal gluten-free burger birthday cake Vida Bakery made above. 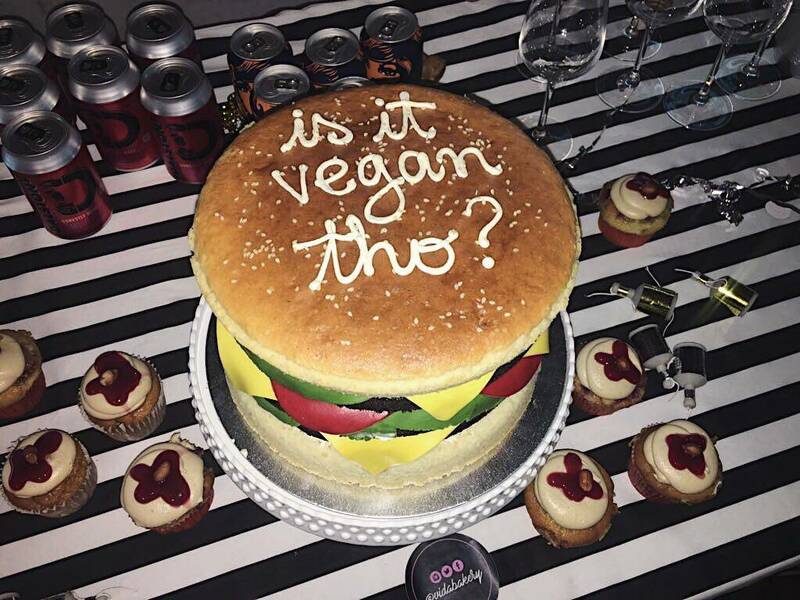 They often sell fabulous cakes (rainbow, chocolate, cupcake, you name it) at vegan markets around London! You will also be able to catch them at the next Vegan Nights LDN on Brick Lane! Vegan burgers in general as a menu options can be wildly creative or fairly standard. Both delicious in their own ways depending on what you fancy. 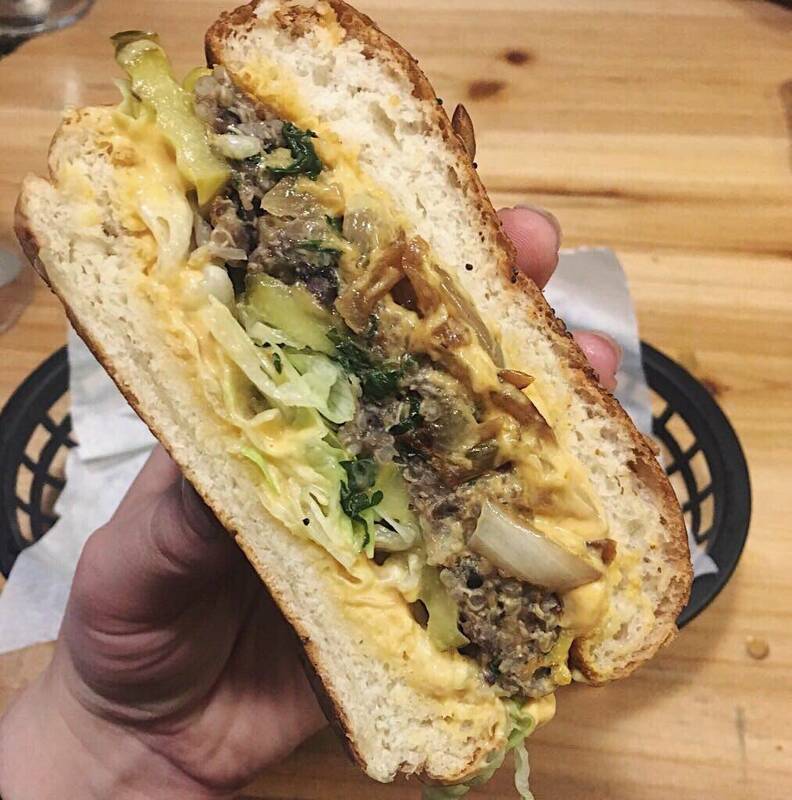 Mooshies specialise in mouth-watering vegan burgers, and these aren’t your bog standard vegan burger patties, they are creative and so super delicious. 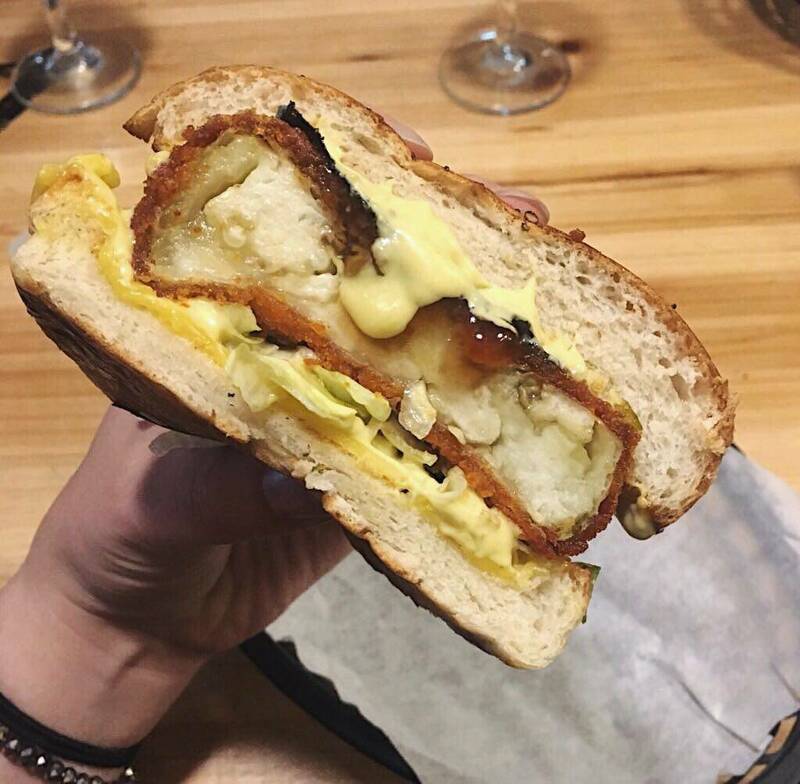 Now these, these are the plant-based burgers vegan dreams are made of. They’re really something else and the burger patties don’t taste like any others I’ve tried. I don’t think there was anything about the food I tried that I didn’t like, absolutely glowing review from me! When an independently owned establishment makes it a whole year, with all kinds of success under it s belt on Brick Lane, you know it’s a business that’s going to be a around for a while. 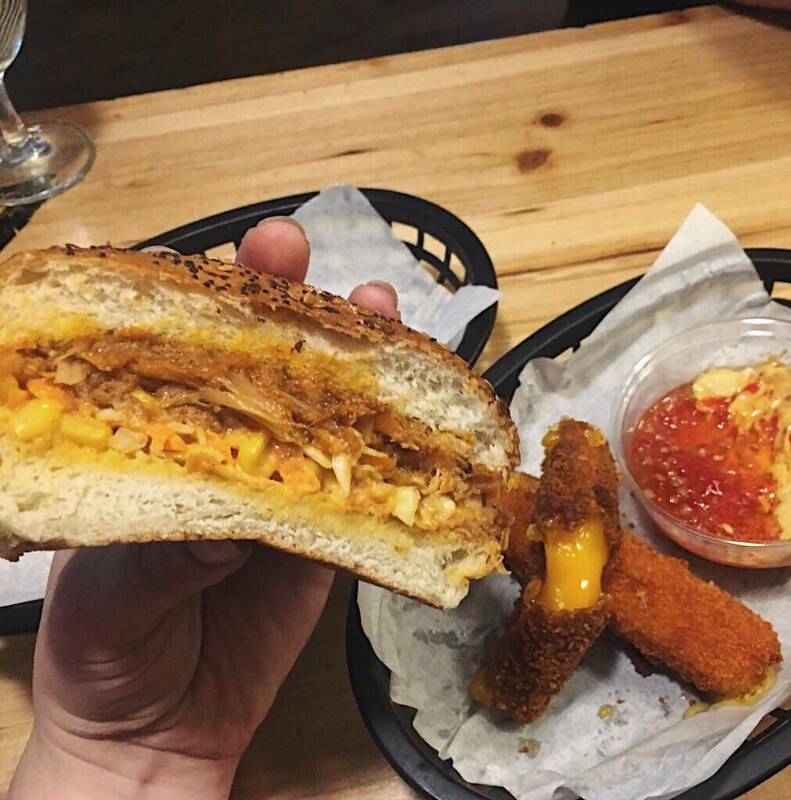 However don’t let that put you off visiting immidiately because I think everyone (vegan or not) should try a Vegan Burger from Mooshies ASAP! Check out Mooshies website here! 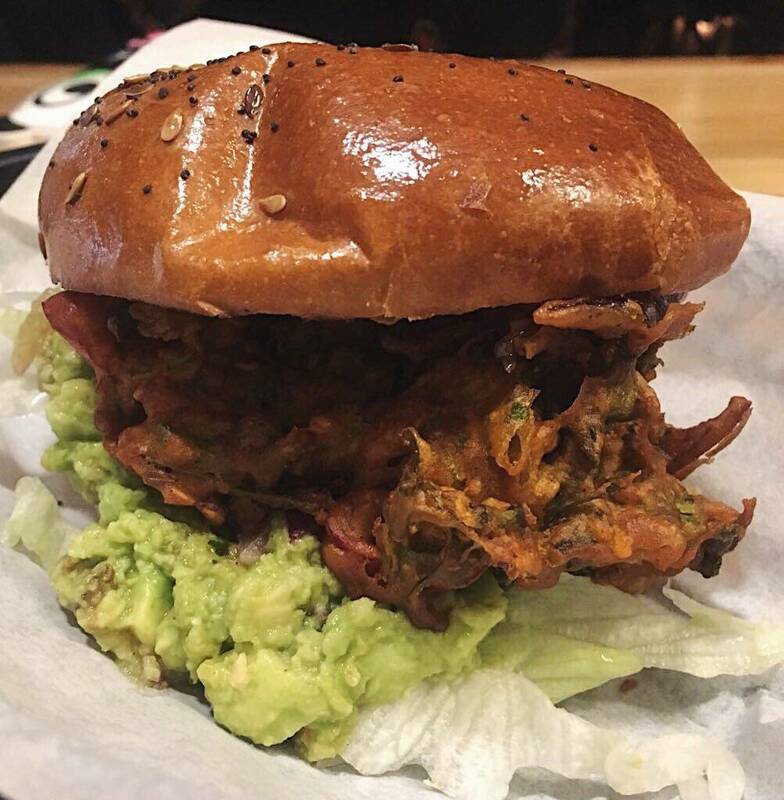 If you enjoyed this, why not check out my blogs about the vegan chicken you can get at Temple of Seitan or the vegan burgers available from VBurger in Camden? Unnnnffff these all sound amazing, even to me, a meat eater! I need to try the Bhaji one and the “What The Beef?”.